... AND I LET MYSELF BE DUPED: Can I Be Offended? The other day in class we had a presentation about lay ecclesial ministry. The presenter, who was sharing the results of her dissertation research was asked she could share about the experience of lay ministers working in the Church after being trained at a school like Weston. One of the anecdotes she shared was that of a woman who was hired to work in a parish. Early in her tenure she felt compelled to point to the collar of the young priest she was working with and tell him something along the lines of "You know that doesn't mean anything to me. I'm not going to treat you any different." Later, she was puzzled why this priest had difficulty working with her. You might remember my recent post about an article by Boston Globe writer Sam Allis. I did write him an e-mail about my reaction to his article. I told him that I was offended by the implication in his article that my life, and the lives of so many who have devoted their lives to the service of God and others, were abnormal because they included a celibate commitment. I also pointed out that making such an insinuation was not even material to his article, nor were the anti-Catholic slurs that followed. His response was telling. He never even acknowledged that there might have been any offense in what he said. For him, it all came down to simply a difference of opinion as to whether celibacy was normal or not. This, and the other story above, got me thinking. Is it the perception in the eyes of many that clergy and religious are without feelings, or is there a presumption that we are not allowed to be offended? It seems at times that we, because of some past offense, real or imagined, on the part of some other member of the clergy or religious life, are not allowed our own personal feelings. We are thought wrong to be offended when someone directs their anger at us. Yet we, on the other hand, are expected to be ultrasensitive, not doing or saying anything that might hold the potential for offending someone else. Parish priests, especially, are sometimes subject to an expectation that they should be able to anticipate the possible reaction of every member of their parish to anything that they might say or do. Having worked on a parish staff in the days before I became a Jesuit, I can assure you this is impossible. Even if the priest were to do nothing, someone would manage to be offended by it. The atmosphere in the wake of the sexual abuse crisis only makes this dynamic even more poisonous--clergy and religious are consistently seen in the media as offenders, and well-meaning people like the spokespeople for SNAP and other organizations repeatedly seem to insist that clergy and religious have no right to be offended, even when responding to false accusations. I wonder if this is a heightening of the former (was this still very much the case before the crisis? ), or is the former more the product of the latter? It may be that this is just a consequence of answering the call to priesthood or religious life. Maybe we should simply accept that this is the case, and not whine about it? Maybe so. But if clergy and religious are not allowed to be sensitive to their own feelings, how much can we expect them to be capable of being sensitive to the feelings of others? I'd be interested in knowing what people think about this. My first thought is that your comments sound a lot like those of me and my government office co-workers. We have often felt that some people really like to put the "servant" into the term civil servants. I think part of it is being a member of a large visible organization, part of it is that the organization has had some very visible problems in the past and the biggest part is that your goal is to serve and help people. Somehow that seems to put blinders on some people and they are unable to realize that it is a "person" that is helping them. In my job, we are not allowed to respond personnally to any attacks only professionally, no matter how much we want to. Although our business is maintaining provincial highways, our work often affects people personally and they take their anger out on us sometimes even publishing incorrect information in local newspapers. We have to remain professional and remember that it is about the person that is angry or just plain wrong, not about us. Our only means of response is to do our job and do it well. That includes taking care of ourselves and remembering that while it seems like a personal attack or an attack on our profession, the problem is really with the attacker. As far as I can see, the answer is education, especially by example. This seems to work really well with the, unfortuantely, usually silent, majority. I do find the whole thing a very challenging part of my own life journey and I feel much empathy for those in similar situations, espescially clergy and religious since your jobs are so much more personal than building highways! I admire anyone who puts themselves out for others as part of their jobs. I don't expect to agree with them on everything, but I respect them anyway. A priest is putting his whole life on the line for what he believes in. I respect that, even if I don't always agree. Of course you are entitled to your feelings, Mark, but I think I would try to figure out whether the person offending you is really aiming at YOU personally, or at the Church. There is injustice in all organizations, and the Church is no exception. Lay people have no way to deal with this. We have no representation in the Church, no shop steward to speak for the married, the women, the children, the non-ordained. Only priests get to make decisions. Only priests can have their voices heard. This can be pretty frustrating for a lay person, and if you're the only collar around, you might end up being the target for anger that should really be aimed at Rome, or history, or St. Paul, or whatever. It's not always personal. But because you wear the collar, you're seen as the local rep. I realize that that might not make it hurt any less, but maybe it's easier to take if you understand where it's coming from? As for celibacy being abnormal, it IS! Be proud. What's wrong with abnormal? Isn't the normative adult human relationship a heterosexual relationship? Otherwise how could the race continue? Celibacy isn't wrong. It's just not the normal state. In the very act of our creation we're told that the image of God is male and female together. Not male alone. Not female alone. Celibates choose to step outside that image, to move away from the normal course of human relationships. It IS outside the normal, and that's WHY you do it --- isn't it? Gone are the days when priests or religious will automatically get the respect due to them because of their role. Instead, you almost have to start off as some kind of pariah in society and work toward getting the respect. It's not right--but I guess it's the kind of martyrdom that clerics/religious can expect in 21st century Western society. Celibacy has always been a part of the range of human sexual behavior for both secular and religious reasons. To tie that behavior to a spiritual and service oriented mission in obedience to the Church is a beautiful thing. I would love to see someone write about the proven (positive) affects of celibacy (akin to other forms of abstinence) on consciousness. 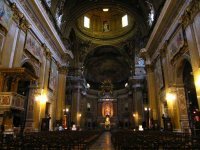 Despite the historic reasons for the Church opting toward celibacy for its clergy, it is well established that abstinence in multiple forms assists those who wish to achieve states of consciousness that reach outside of the mundane. Anti-Catholicism (and anti-clericalism within the Church itself, I might add) creates a total hysterical blindness on the subject of the history of celibacy and its neurogcognitive effects it is mind boggling. Several years ago, unless I really knew a priest (or upcomming Jebbie). I could be rather, um, abrasive (yeah thats a nice way of saing it). You are entitled to your feelings, because they are your feelings and they are neither right nor wrong. But do realize that most people are ignorant, a few are rude and some of the rest of us have (had) serious issues with the clergy who thought it sickly amusing to play bait the collar and see how far we could push it. I certainly agree with the lines of thoughts in these comments so far, and my take on it has the same mix of feelings. On the one hand, we who are religious and/or clerics are signs and representatives of God and his Church in this world, and rightly so. But this means that sometimes you have to absorb some of folk's anger at God and the Church. It's hard enough not to take this kind of thing personally, which can be very harsh, but, as Scripture has it, we are supposed to aspire to rejoicing when we are deemed worthy to share in the sufferings of Christ, as it were. On the other hand, it's not an excuse for rudeness among colleagues or in the workplace, such as in the story of the lay minister having to defend herself against something as simple as a clerical collar. One would hope that by the time someone had come to the point in their ministerial vocation when they were fully trained and employed by a parish, they would have worked through all of their resentment at the clergy and the Church enough so as not to bring such distractions and irreverences into the workplace. Thanks for the post, it hits home in several ways! My opinion is much in line with what the others here have said. The power is in the hands of the clerics; when it's used with discretion, sensitivity and altruism then people don't care so much about it (in my opinion, again). But there are priests out there who abuse their power, and that leads some laity to resent the lack of real lay-power in the church. And for some (many? ), there's a real & credible gulf to bridge due to the recent priest abuse cover ups. I know 'servant-leadership' is not perfect or universally-accepted, but given the power structure of the church and the ever-increasing education of the laity I think this is the best leadership approach for priests these days. Among many things, leadership is one of the most important things priests bring to the church. One last thing - there are many of us who have a great deal of respect and admiration for the priests we know, those we work with, and those who serve us. We should probably express that more often, because it can be wearisome to hear only the negative, bad experiences all the time. So, Mark - thanks for writing this blog, for serving us - the church - via your vocation, and for bringing a reasoned clerical voice to so many topics here. I'm glad you're here and glad that you joined the Jesuits. Having been an Ecclesial Lay Minister, I can empathize with this woman's frustration. I worked for a priest who never took into account that I was a well trained DRE and would listen to the untrained members of his parish over me (in fact he now has untrained volunteers doing my job becuase I quit because I couldn't work with him). I never would have said what that woman said. Because of his ordination he is the primary decision maker in the parish and when I realized that he was never going to be able to appreciate or understand my viewpoint I realized that I would have to leave my position. Some (not all) members of the clergy don't understand how valuable well trained Ecclesial Lay Ministers can be as assets to their staffs. This acrimony cuts both ways. Having endured what I did, I don't know if I will ever be able to go back into parish ministry. Even if I were lured back by the most amazing offer by a priest I really admired, he will eventually get transfered some day and I might be right back where I was with my last boss, trying to make him understand why I was a necessary part of the parish budget. I think it all boils down to respect. Today's culture and mentality has pushed humanity back into the dark ages where large cities are full of technologically advanced gadgets, wonderful homes, well-rewarded salaries and cushy jobs yet with no values like trust, love, loyalty, faith and respect. Most of the people around us don't value people as human beings. Once this value and dignity fades away, then there is no respect. And since there is no God for many people, then the priest is just another "normal" human being who is foolish enough to waste his time trying to help others without getting anything back, torturing himself without having an intimate relationship with a woman and being stupid enough not to lean on his own understanding but on a non-existent higher being that he has faith in and calls God. Sad! It is really sad! All we can do is unite and pray! As St. Paul said, it is a spiritual warfare and this is a battle to be won on our knees! Maybe one day, our kids will have a better future. A Jesuit friend of mine (much older than you) says, "A guy in clerics is a walking Rorschach Test." That is to say, all anyone sees is the collar, and if they instantly assign you sainthood or they demonize you, based on their own personal experience. Having gone on two vacations now with habited nuns, I got to witness a lot of this up close. Whenever we sat down to have dinner, the waiter would immediately remove Sr. Anne's wine glass -- too bad if she'd wanted a glass of wine! And a (demonic?) bum followed us through the Piazza Novona, barking at her like a rabid dog. I disagree with people here who say that the priests have all the power. Wow. I guess I've been in L.A. and Orlando too long. The woman who runs the religious ed program in the diocese has far more power than any priest I know, which the exception of the bishop and I think there it's a toss up. I am very distressed by the way priests are treated by lay people these days. Aside from the trend in that direction BEFORE the scandal broke, I think that since then, there has been a feeling that priests are fair game for insults, venom, or even just (as in your example) active disrespect. I really believe the heart of the problem is how badly catechized everyone is these days. They don't really know much about why things are the way they are, so they base their feelings on soundbites they've picked along the way. This is especially true when it comes to the issue of celibacy. Many (if not most) of the people who are blasting it as a concept have no real understanding of what it means. How do you solve that? Beats me. Point it out, I guess, instead of accepting the fact that you're suddenly playing defense. Or...maybe something like a television series on AMC will come along and enlighten a few people? I lit a candle for you and yours at St. Pat's yesterday. Don't lose sight of the fact that there are those of us out here who are DEEPLY grateful for what you're doing, and what you're sacrificing in order to do it. Two things come to mind. First, your reaction seems to be from emotivism: I feel bad about what someone has said or done—therefore I am a victim of what someone else has said or done—therefore the other person now has a moral obligation to change their view (or at least their expression of their view) or actions in order that I not feel bad. Further, that anecdote about the lay woman in a parish is very revealing. Obviously we would need more information to really comment appropriately, but it seems on the little evidence we have that she has an allergic reaction to clerical dress or to the very nature of the priesthood as understood in the Church, and probably both. Weston, I feel, is doing an injustice to lay men and women by not clearly and directly explaining the distinction between lay and clerical roles in the Church, and having those prospective ministers ask themselves whether they are ready to work in the real Church. Many come out of our theologates with the absolutely false notions that Vatican II blurred the lines between priests and laity and that women and married men will be ordained and that it is unjust that they are not. This fantasy-land Catholicism has just led such graduates to a long life of ecclesial disappointment and resentment. Karen, your experience reminded me of the day last year when I ended up sharing lunch with a priest and another Kiwi guy in Lourdes. First we bought our lunch in a boulangerie: I was intrigued that the young women serving at the counter were very quick to serve the priest, and he wasn't expected to speak any French. Then we found a park bench to sit on and the fun started. A guy who appeared to have mental health problems, saw the dog collar on the priest, and started loudly ranting to the skies. We had to move around to make the dog collar less obvious, and the guy eventually moved on. As an "ordinary" person, it was not something I had ever experienced before. Thanks folks! I think what Trish said is important. This, undoubtedly, is a phenomenon experienced by many in the "helping" professions. And I certainly know that a certain amount of persecution comes with the job (actually, it comes with the job of being Christian, according to Jesus). But I'm most struck by the fact that someone might not even consider the possibility that someone might be offended when criticizing someone's vocational choice and life commitments. Talmida, as far as celibacy being "abnormal," I see what you are getting it. Indeed, I may have said something similar myself in the past. But what's curious is that it is a life choice that's only come to be seen as abnormal--especially in the way Sam Allis believes--in the last hundred years or so. Maggie, I know it is a two-way street, and I know the difficulty you had. I'm sorry for that (maybe you can come work with me one day!). Rogue, looks like you are one of my fellow students, Jesuits or both. Thanks for your words, though maybe a little too much psychoanalysis. We do need to work on these things at places like Weston. I thought about posting a dissertation on the nature of rejection by someone who knows you vs. someone who doesn't. But that's not the heart of it - it isn't something that happens by degrees. Someone has said something cruel. Maybe it was not about you specifically but it was about what you've chosen and how you love. In my mind, that's about as personal as it gets. So, if and when it happens again and until they are able to see what it is they do... Please accept my apology on their behalf. Yeah, tack on what Miz Karen said to my account also. Hm. I've been thinking about this one a lot, because I get a different form of anti-Catholic sentiment. Like one person flat-out told me that everyone in academe had to be atheist, because he couldn't conceive of a "thinking person" being Catholic. At the time I was hurt, stunned, and couldn't think of a comeback I could use in polite company. I'm still not sure how to respond to someone like that, but I think I'd rather lead the best life I can and show by my actions what a bigot the person is. Then again fundamentalism in Catholicism and Christianity doesn't make it easy on anyone. Sorry Mark... no offence intended! It is what it is usually called in this part of the world. I just did some research on Google.... seems like 'dog collar' is more in use as a UK term. We get more of our English from the UK than the US here in New Zealand! Americans always get confused by "dog collar." That's very funny. 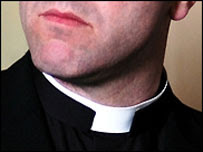 ;-) "Clerical collar" doesn't usually get me very far, either. You know, in an ostensibly Christian culture that considers serial monogamy "normal" (seen this? ), it is really chastity that is abnormal. That really makes vows of any kind, whether to marriage or celibacy, completely incomprehensible. Yeehhaaah Kyle! Great to find a kindred spirit in the comments boxes who understands "my" brand of English ;-)I have occasionally got myself into trouble online when perfectly innocent words here have quite a different idiomatic meaning in the US! It seems to me that people in general have no reservations about making comments on "abnormal" life choices- even if you don't wear a collar. If you have more than 2 children, you get comments like "You know where babies come from, don't you?" and others that are pretty much unprintable here. I am friendly with 2 families that have 6 and 10 children each and it is amazing how complete strangers will make snide comments to these moms about the size of their families. What they get from members of their extended families is even worse. What us lay folks don't get, unless we work for Holy Mother Church, is the pent-up whatever that people have against the Church spewed at us. And we don't ususally get it in the supermarket or on the street because we don't wear a collar. I think that what Karen says about poorly catechized adults is important to note. If folks understood better about holy Orders maybe you wouldn't get it as much. Your story about that laywoman in class sort of surprised me, though maybe it shouldn't. Sure, a priest is a human being, just like me (or her), but he has recieved Holy Orders, which has left an indelible character on his soul making him completely different from those of us who have not received that sacrament. Pity that she can't respect the sacrament as well as she should, even if she can't bring herself to respect the priest. The last forty years priests/theologians have been trying to tell the layity that priests are just like everyone else. They, the priests have not been wearing their collar because of fear, laziness, embaressment or out of just plain spite. The North Americian Jesuits love a blue suit. Gone are the days when Jesuits were proud to were their black cassock's with a roman collar. Absolutely there should be an emotional reaction - that means your human. That reaction is what helps tell us when something is not right. The woman was wrong and in need of some Christian correction. Doing so in anger is a bad idea, but the anger itself lets the person know of a situation that requires attention. There is nothing wrong with the feelings - it is what you do that matters (and just bottling them up is not a good idea). Btw, I am offended by people who treat priests poorly. It makes ME upset. I hope that my priests are upset - what they do and what they are is vital and one of the most important things. Disrespecting priests disrespects what they do - including transforming bread and wine into the body and blood of Jesus Christ. That collar means a lot - we all should be upset when someone disrespects it. One of the silent people who doesn't say anything unless there's a problem. So, even though there's not a problem, thanks for pursuing your Vocation and for trying your best! And also thank you for posts that remind us that priests are people, too. I used to complain about everything... but posts like yours help to point out that priests usually don't have a clue that they're offending anyone. Georgetown Needs to "Come Out"